New food design contest on Desall.com: Barilla and Desall together for the creation of new pasta shapes with a fresh design and unprecedented potential, to be realised through the innovative pasta 3D printer, presented at CIBUS 2016. 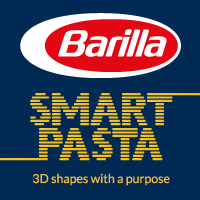 Barilla, always attentive to innovation and technological development, is looking for new pasta shapes specifically designed for the innovative 3D printer for pasta, first announced at Expo 2015 and presented to the public at CIBUS 2016. Barilla, which is about to celebrate the 140° year of activity, now relies on the community of designers and creatives of Desall to explore the huge potential made possible through this new production technology, conveying into an innovative shape the values and the care for tradition that have always characterised the Barilla brand. Objective of the contest: starting from the innovative 3D printer by Barilla, which enables the exploration of new frontiers and to engage in otherwise impossible tracks using the current industrial production technologies, you are invited to propose the design of new pasta shapes to be exclusively realisable through 3D printing technology, conveying all the passion for pasta and for aesthetics into innovative and unique shapes. Size: do not limit yourselves to what you have seen so far in the pasta world, but go beyond that, exploring all the potential and possibilities enabled by this new technology. Among the most interesting aspects, size is one of them: keep into consideration that the maximum printing area can go far beyond the standard size of the most popular pasta shapes. This enables you to explore new concepts and engage in tracks so far untried. Pasta extra functionalities (nice to have): in addition to the formal aspect, that shall play a major role in your design, think what further values and functionalities you might obtain through this innovative technology. Try, for example, to think how the pasta shape you suggest might interact with the other ingredients of the recipe (i.e. how the sauce will be contained in the pasta shape, how it will blend with it, etc.). Otherwise, try to consider the various effects you might obtain, changing the pasta geometry in some points, causing a metamorphosis, a change of state, a transformation of the pasta shape in the cooking or preparation processes. You are free to explore these or other concepts at your wish. As a mere example, you can find some instances of the pasta functionalities in the document you can download from the Material files. Target: while suggesting your pasta shapes, take into consideration that the 3D printer for pasta might be employed both in home and professional environments, enabling the realisation of innovative pasta shapes and highly customised flavours, through the selection of geometries and ingredients. Deliverables: upload all the materials that better present your projects (rendering, descriptions, CAD files, etc. ), taking into consideration that projects containing 3D files will be particularly welcomed. Remember that you can also attach a .zip archive containing extra materials. Don’t forget about the abstract and description to give further info about your projects (i.e. unique features of the pasta shape, functionalities, interaction with the sauce, senses stimulation, info for the designer, for the user or for the customer, etc.). And remember, you can submit as many entries as you like! Participation is free of charge and open to designers and creative talents of any nationality aged 18 years or older. Participants can present one or more projects, but only the projects published on the www.desall.com web site, via the upload page related to “SMART PASTA” will be accepted. The selection of the winner by Barilla will be the result of an unquestionable evaluation and it will take into account originality, feasibility and consistency with the brief. For the duration of the option right, the Sponsor offers an extra chance to all participants setting a price of Euro 1,000.00= (one-thousand/00) for the purchase of the license for the economical exploitation of the projects considered of interested even though not-acknowledged as the winning proposals. Do you want to stay updated about "SMART PASTA"?